1. 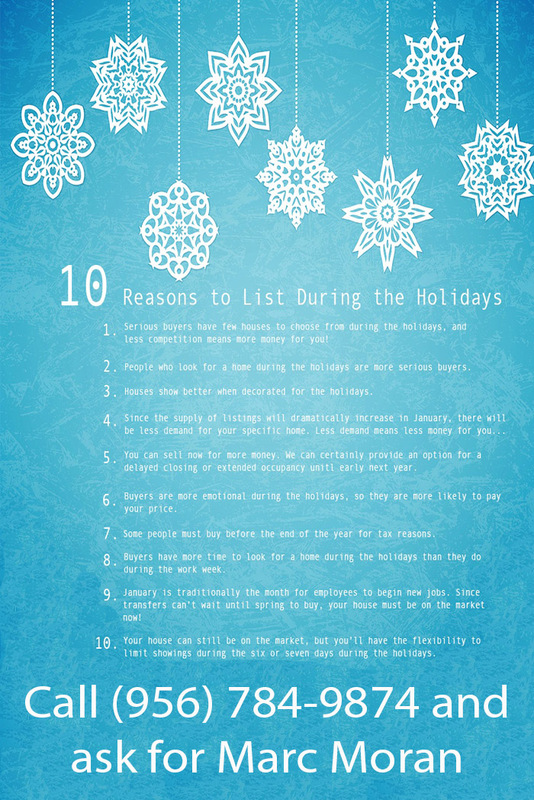 Serious buyers have few houses to choose from during the holidays, and less competition means more money for you! 2. People who look for a home during the holidays are more serious buyers. 5. 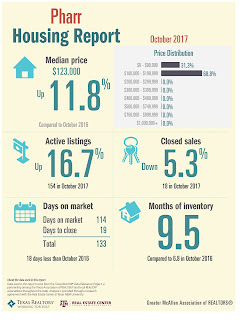 You can sell now for more money. We can certainly provide an option for a delayed closing or extended occupancy until early next year. 6. 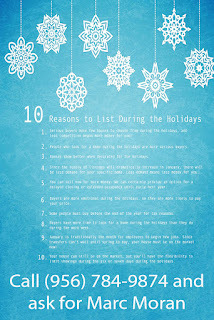 Buyers are more emotional during the holidays, so they are more likely to pay your offering price. 8. Buyers have more time to look for a home during the holidays than they do during the work week. 9. January is traditionally the month for employees to begin new jobs. 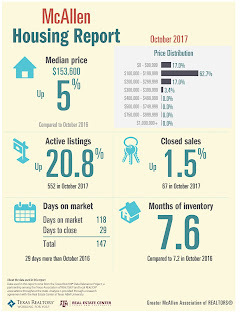 Since transfers can't wait until spring to buy, your house must be on the market now! 10. Your house can still be on the market, but you'll have the flexibility to limit showings during the six or seven days during the holidays. 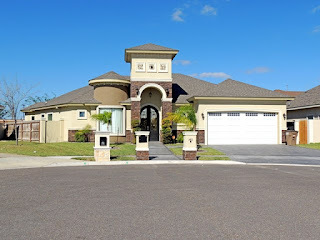 We have information on all the single family homes for sale in McAllen Texas, Plus all the current real estate listings that are available in the Rio Grande Valley. 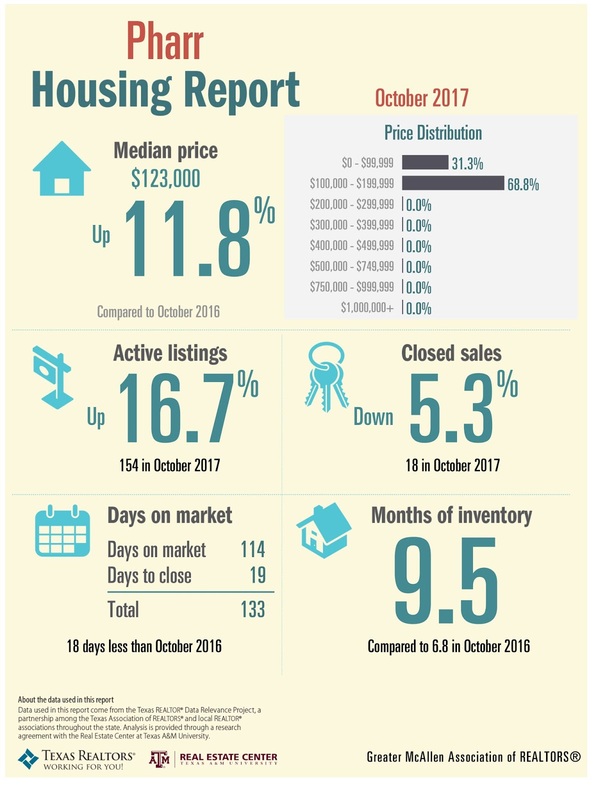 We can also provide you with the home values for the different properties in the McAllen TX area. 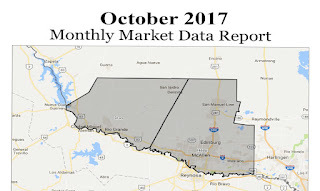 If you're looking to buy or sell in McAllen Texas, then let us know. 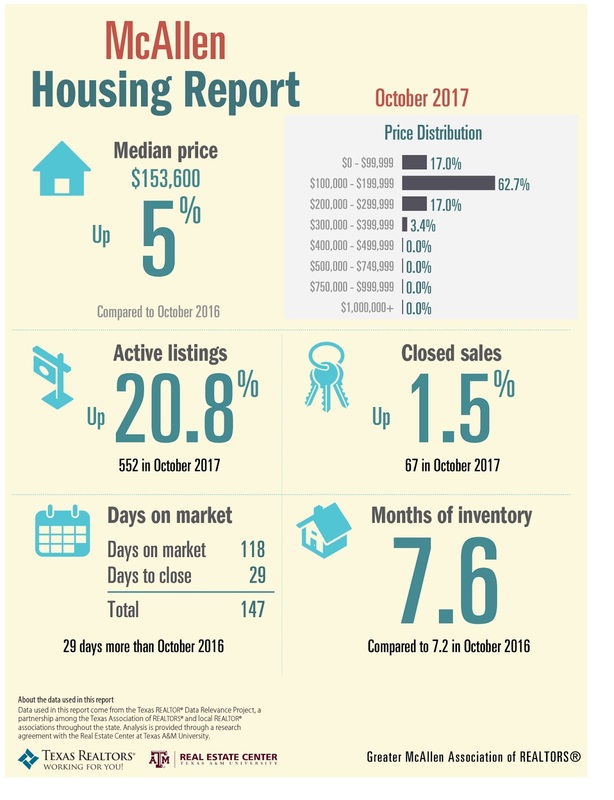 We will make it easy for you to find the home of your dreams. or Give me a call at (956) 784-9874 to Help you. 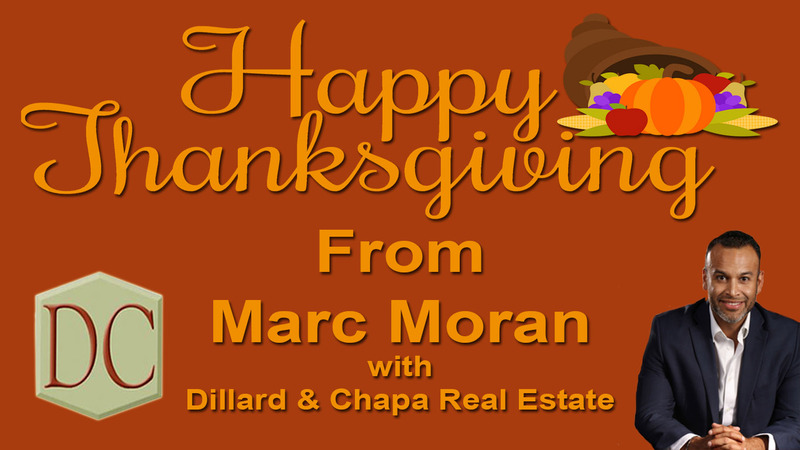 On behalf of Marc Moran with Dillard & Chapa Real Estate we would like to wish you a Happy Thanksgiving! Spend more time with your Family. May God Bless You and Your Families. 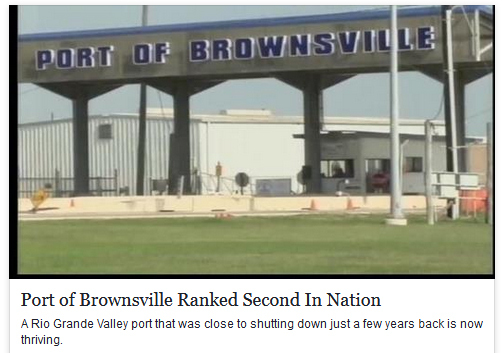 Port of Brownsville ranked 2nd in the nation. Ever wonder why they call our area the Third Coast? 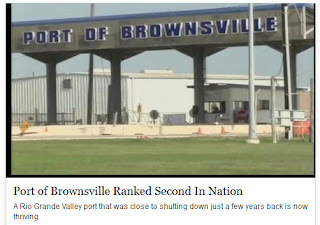 Via the Port of Brownsville, we have access to the Gulf of Mexico and Atlantic Ocean and with improved interstate highways in Mexico, we also have access to the Pacific Ocean via the Mexican ports of Manzanillo and Lazaro Cardenas. The ability to ship quickly and efficiently all over the world is a top priority for manufacturers, and it's one of the reasons McAllen/Reynosa and our entire area continue to draw the globe's top companies to do business here on the border. My Panda Express Fortune Cookie says "Strive for the Best"
How to Stage Your Home for a Quick Sale. 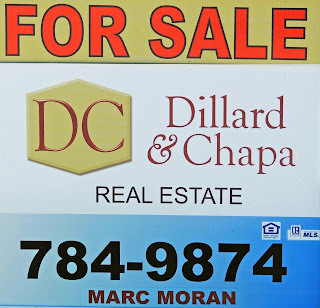 Selling your home is probably one of the most exciting things you’ll ever do in your life, but, if you’ve never done it before, take some time to prepare for this process first. 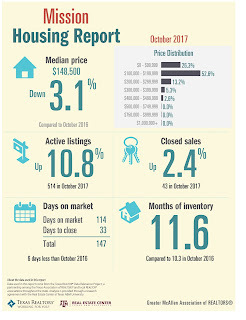 Home staging – i.e. accentuating all the positive sides of your home and hiding everything that’s not representative – is essential if want to get the best price and if you too are selling your home at the moment, here are a few tips on staging that guarantee a quick sale. 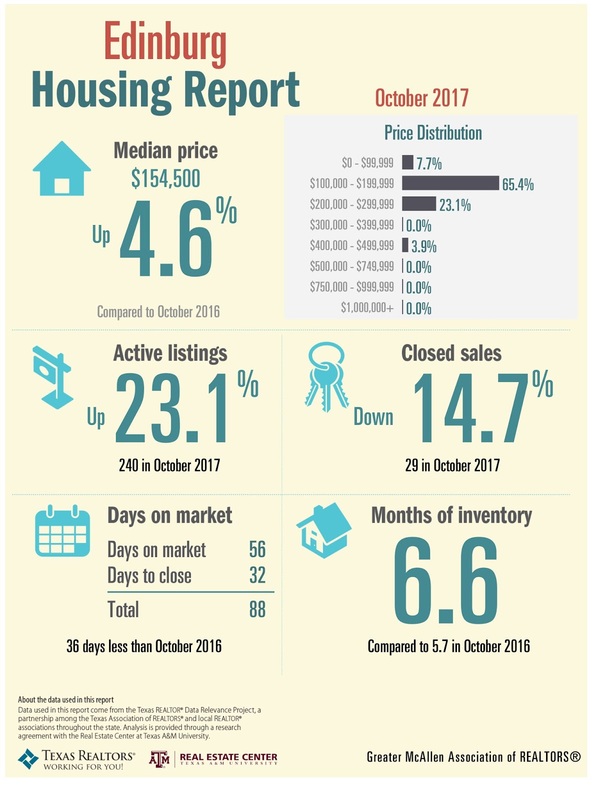 The biggest problem with preparing your home for a sale is deciding whether you want to invest cash into fixing it first or not, knowing that the point of the entire process is earning as much money as you can. Every investment is a good investment and it will definitely make your house more appealing – which is especially important when it comes to making the right first impression – and more valuable, and that’s something you need to think of. However, instead of rushing into unnecessary renovation projects impulsively, think them through and decide what needs to be fixed to make the biggest impact. Take money, time and appearance into consideration and decide what to focus on. What most people do is repaint the interior walls, install new kitchen appliances, add a couple of elegant round rugs in front of the fireplace or the living room sofa, spice up the lawn and decorate the exterior with lots and lots of flowers, because these are the things that make your home cozy, attractive and inviting. A touch of make-up here and there doesn’t seem like a lot at first, but it actually makes a huge impact on potential customers and can be taken care of quickly. How to pick the right projects? On the other hand, every major renovation project takes a financial and logistical toll on your home-selling process which is why you need to pick only two or three things that really need renovating or fixing before you start advertising your home. Leaky roofs, squeaky floors, worn paint and old window frames make a terrible impression on your customers and might ultimately drive them away. Therefore, dig deep into your pocket, see how much money you can spend at the moment and start making viable plans. 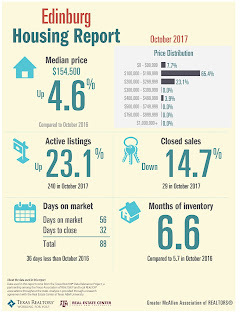 Let’s take an obvious example and use it to analyze the process of home staging. Proper floors are one of the most important assets of a good house and something customers don’t compromise on. Therefore, unless your floors are in the perfect condition – and the chances are they aren’t – you need to shift your attention to them as soon as possible. Old homes usually have a problem with wall-to-wall carpeting that used to be very popular back in the day, but today it’s considered to be quite a big hazardous to your health, so get rid of the carpets right away. Hardwood floors, ceramic tiles and bamboo flooring are all wonderful, yet rather expensive options, so find an alternative. Laminate flooring, for instance, doesn’t have to be that expensive, yet can bring a dose of class and coziness into your home, which is something every buyer will appreciate. Once you’ve decided what to renovate and how to invest your money so that it pays off the most, it’s time to think about the actual work – that’s where another problems arises: the workforce. Hiring professionals is always good, yet it’s quite costly, so ask your friends for help. Although they have no experience in home renovating, they can surely repaint your walls, mow your lawn, fix your fence, make a proper seating arrangement and tighten up a few screws here and there. This way, you’ll save a ton of cash and be sure everything in your home is up to the highest standard. Some of the other things you need to do in order to stage your home properly is decluttering all rooms, setting up lights perfectly and lighting scented candles. 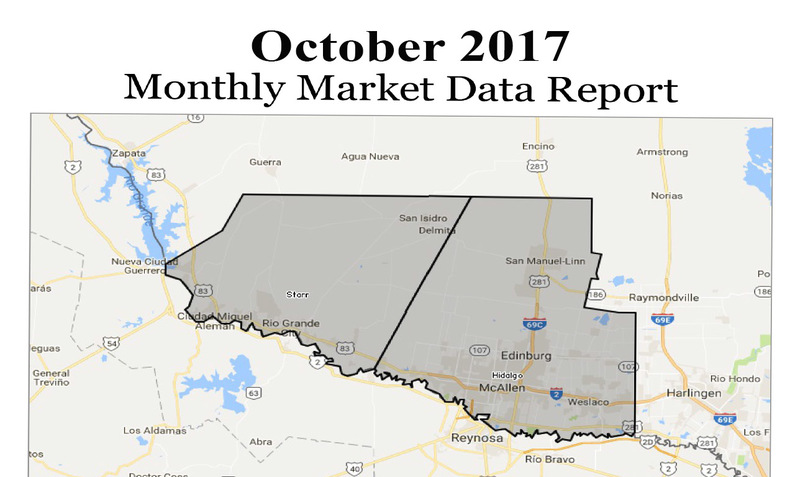 October 2017 Monthly Market Data Report for Real Estate Sales in Edinburg, McAllen, Mission and Pharr Texas. 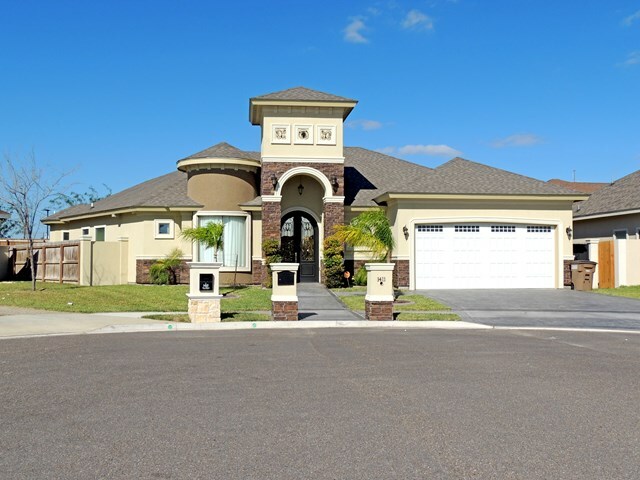 Gated Home For Sale - 1411 July Drive Edinburg, TX 78542 - Gated subdivision of Summer Field Manor. Open-concept, Built in 2016 this one story home features 3 bedrooms, 4 full baths, office, a beautiful kitchen with Island and all tile floors. Split Bedrooms with their own full Bathroom. Master bath has separate tub, shower and a private commode with walk-in closet. Covered patio with nice size yard perfect for family gatherings. 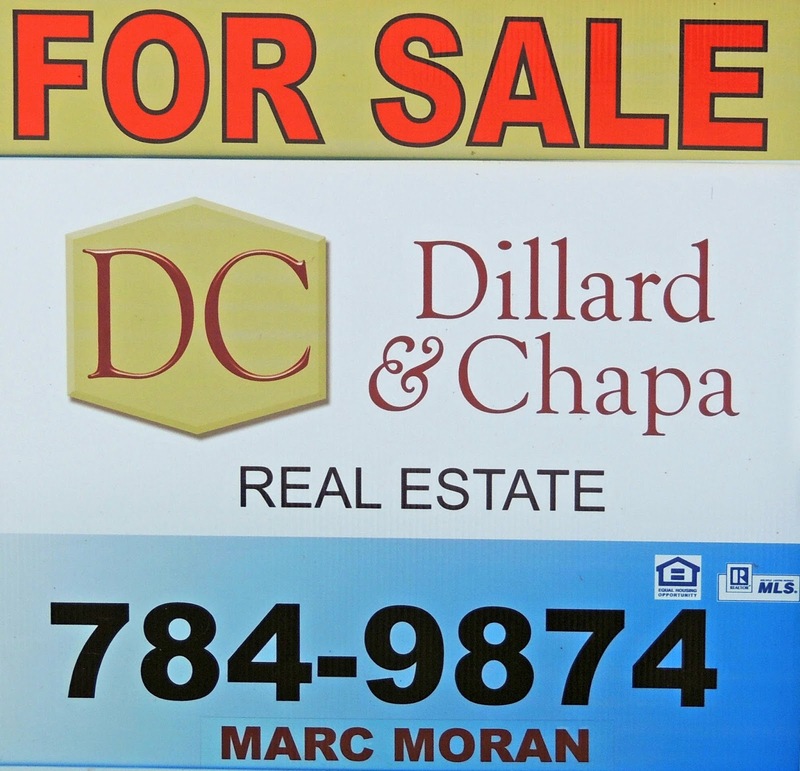 Location close to shopping, hospitals, schools and Expressway 281. Call Marc Moran (956) 784-9874 for a showing.